Customers from all over come to taste our delicious oysters fresh from the water. 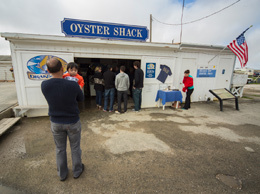 The Oyster Shack and Cannery closed July 31. We are leaving this page as it was, for now, as a tribute to the loyal customers who loved our retail operation. The oyster farm is open from 8:30 am to 4:30 pm every day. All are welcome. Our on-farm retail store features our freshly harvested oysters to take home or enjoy here at the farm. 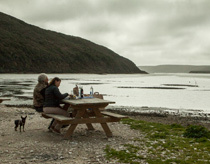 We have picnic tables with gorgeous views of Drakes Estero, where you may enjoy an oyster picnic. Feel free to bring additional food and drink to go with your oysters. We don’t have on-site grills, but you are welcome to bring your own. Portable chairs and tables are also allowed. If you are picnicking at the farm, please check in at the oyster shack and purchase our oysters first. Picnic tables are first-come, first-served—no reservations. The farm offers oysters on the half shell, shucked for you; oysters in shells that you can shuck here or take home with you (bring a cooler; we will supply the ice). We also offer shucked oysters in jars to enjoy here or take away. Our oysters are available in a variety of sizes—we usually have extra-small, small, and medium oysters. A picnic by the water is a great way to enjoy the surroundings ... just as people have done for generations. If you are placing a large special order, a phone call a day or two before pickup is recommended. Our retail store also sells soft drinks, bottled water, local cheese, crackers, jam, a variety of sauces for oysters, lemons, and oyster-shucking knives. Well-behaved, friendly dogs are welcome, on-leash only; you must pick up after your dog. This is a working farm, where our visitors can enjoy the ambiance of oyster farming and learn about this sustainable food source. Our sales staff is happy to speak with you about farm operations while you are here. We are often too busy to provide informal tours, especially on weekends and holidays, but if you are interested in learning about the farm, visit on a weekday morning and we may have time to show you around. Call the farm at (415) 669-1149. The oyster farm is at risk of closure! See pictures, read about the issues, share your comments, and ask us questions on Facebook. Also check out the savedrakesbay.com and Oysterzone websites for more information.